This Burger King worker was not happy when a customer requested a refund because she was dissatisfied with the quality of a milkshake. 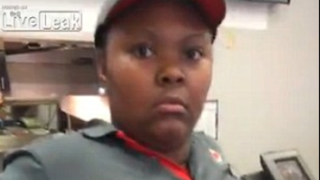 With cellphone video camera running, a customer got the wrath of a Burger King employee in Louisiana after asking about four times whether she could speak with a manager, Live Leak reported. Finally the customer asked for a refund, to which the employee responded, "Baby, you're about to get it. Just wait. You're gonna get your s—t." "You're cursing," the customer replied during the April 7 incident in the city of Lake Charles. "Are you serious? Are you serious? You cannot treat people like this. This is your job," she continued. "Are you for real?" "No, I'm fake," the employee said. The customer tried a kinder approach: "I don't know what happened to you today. And I'm sorry, but you handed me soft-serve ice cream and then gave me some garbage, and I'm not going to eat it." This might have worked, but at the tail end of her message, the customer added, "And you're rude." "I don't give a f—k, go ahead," the angry employee snapped back. The employee then walked from behind the counter to confront the customer. "Do not touch me," the customer said. "Take my picture," the employee repeated. "I'm making sure that I'm going to be safe whenever I walk out of here," the customer said. "What you mean?" the employee said. "Go! Bye! I don't give a f—k. She trippin'." Another Burger King worker tried to defuse the situation, but the confrontation continued. "This place is getting shut down," the customer said. "I'll do whatever I can." The employee moved closer to the customer, who said, "Get off of my foot! This is assault. I'm calling the cops." "You wanna get slapped?" the employee asked. "You wanna get slapped?" Burger King said in a statement that it was aware of the video footage and added that the employee had been fired, according to The Blaze. "Guest satisfaction and service are of the highest priority to everyone at BURGER KING restaurants," the statement said, according to The Blaze. "The franchisee that owns and operates this restaurant has terminated the employee involved and has reached out to the guest directly." Read more at Live Leak and The Blaze.